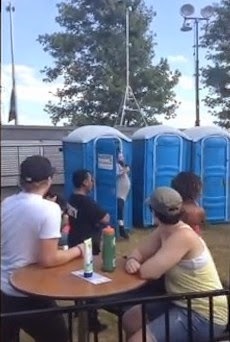 Talk about having "flow" ... Rapper Action Bronson TOOK A PISS in a port-a-potty during a live concert this weekend -- while continuing to RAP during the ENTIRE bathroom break!!! Bronson was performing his song "Shiraz" at the Ottawa Bluesfest on Saturday when nature called -- but he didn't stop the show ... he grabbed the mic and continued to rap while he strolled to a bank of blue toilets. Then ... while in the pisser ... he CONTINUED TO RAP -- without missing a beat!!! He eventually emerged to huge applause ... and continued to rap as if it were no big deal. . The most impressive part -- it looks like he used a paper towel to open the door from the inside so he didn't have to touch the handle ... WHILE RAPPING!! !